Two paintings by River City Art Association member Eugene Thomas of Fairview Park, Indiana, earned him Best of Show, First Place and Third Place honors in the Covered Bridge Art Association Associate Members Show featured in July in the CBAA Art Gallery at Rockville. A closing reception is set for 2 to 4 p.m. July 30. 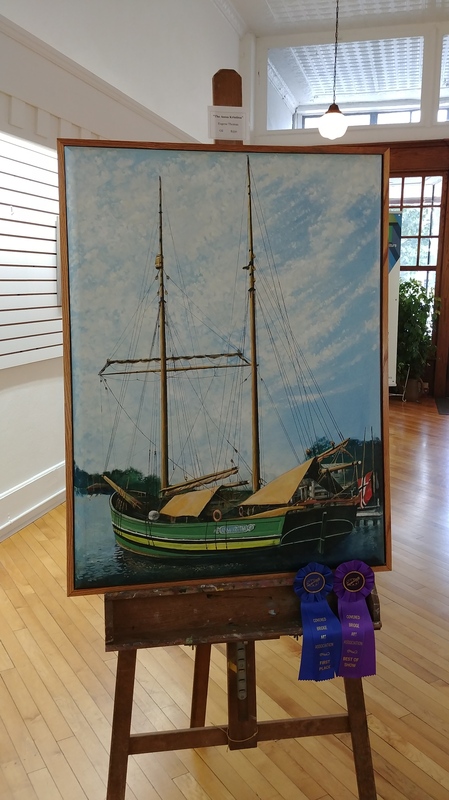 Eugene received his Best of Show and First Place in the oil/acrylic category for “The Anna Kristina,” and a Third Place for his “Norton Creek.” As Best of Show winner, Gene will be featured in a one-man show in August 2018 in the CBAA Art Gallery. Other RCAA members receiving honors in this show include Monty “Indiana” Jones and Edith Acton, both of Terre Haute, and Sheila K. Ter Meer of Brazil, Indiana. Monty’s oil/acrylic entry, “The Rolling Stone Bridge,” (in Putnam County) received an Honorable Mention. In the mixed media category, Edith’s “Garden Gate” was awarded a Third Place and her “Basket of Flowers’ received an Honorable Mention. Sheila was honored with a Third Place ribbon for her entry, “Squire Boone’s Keep,” in the Photography category. This entry was posted in Member News and tagged Art, artwork, Covered Bridge Art Association Associate Members Show, mixed media, painting, photography, River City Art Association, Rockville. Bookmark the permalink.